Apple has found themselves on somewhat of a product release spree in the last two months, with a new iPhone, a new range of iPods and two new iPads being released to the public. Put that together with the launch of the 13-inch MacBook Pro with Retina display and the imminent release of refreshed Macs and you have a very packed Apple hardware refresh. With all of this new technology coming out, the jailbreak world may have taken a public backseat recently, but legendary iPhone Dev Team member MuscleNerd has just updated his Twitter feed to make sure are all aware that things are still bubbling away in the background. 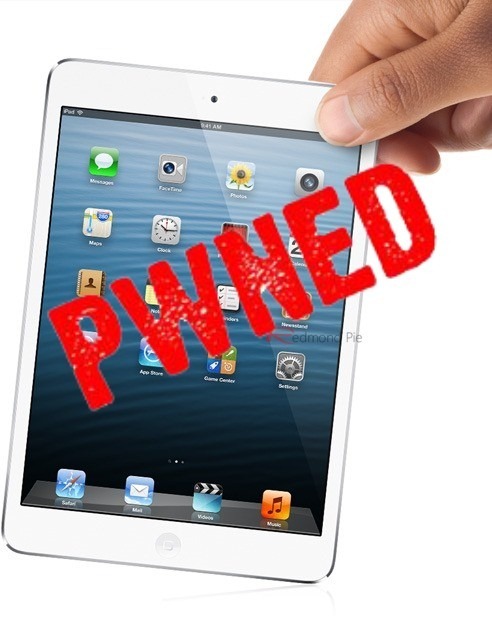 As part of the so-called jailbreaking Dream Team, MuscleNerd has been at the forefront of all things jailbreak in recent times, and has today posted an image on his Twitter account of the jailbreak dubbed as "failbreak" running on a brand new iPad mini that has only just landed in stores around the world. In terms of what this post and image actually means for the jailbreak community on the whole is difficult to say, primarily because the failbreak is in existence purely for developers and security researchers to get an upper hand as they look for exploits that can actually be released as part of a stable, untethered public jailbreak for new devices and software versions. Those that do keep tabs on what is going on in the jailbreak world may be aware that well-known developer Grant Paul – more commonly known as chpwn – posted pictures of his own iPhone 5 jailbreak that had only just been released. Although it created a wave of excitement amongst those who thought iOS 6 and the iPhone 5 hardware had already been bypassed, it transpired that the jailbreak couldn’t be released to the public due the requirement of needing an Apple developer account to work. The failbreak was born. In the time that has followed, Planetbeing has managed to breathe some additional life into the jailbreak by upgrading it with a kernel exploit, which means that existing tweaks actually install and work on the iPhone 5 running iOS 6. The addition of a kernel exploit puts the jailbreak at the level of almost being a full tethered solution, but once again, not a publicly viable option as it requires a developer account to be held by the user. MuscleNerd’s latest addition to the status of the iOS 6 jailbreak doesn’t mean that we will see something for public soon, but it does give us some confidence that work is at least continuing in the background. For those of you who are still rocking Pre-A5 based devices, you can jailbreak iOS 6 and jailbreak iOS 6.0.1 using Redsn0w. The jailbreak though is limited to tethered boot-only for now.